Follow this one-day Chicago group itinerary to explore the fascinating parks and institutions that make up the sprawling Millennium Park Campus. Chicago’s newest town square is the downtown Millennium Park Campus, made up of the historic Chicago Cultural Center, esteemed Art Institute of Chicago, exciting Maggie Daley Park and the arts-filled Millennium Park. We’ve planned a one-day Chicago group itinerary, from morning to night, to help you explore them all. Begin your day at the beautiful Chicago Cultural Center, which served as the city’s first central public library in 1897. Today the Cultural Center offers a variety of free arts programs, including the popular Dame Myra Hess Memorial Concerts held every Wednesday at 12:15pm in Preston Bradley Hall. These 45-minute classical music concerts feature a lineup of emerging artists, from violinists to pianists. There are also a number of rotating art exhibits to discover, located in galleries throughout the building. 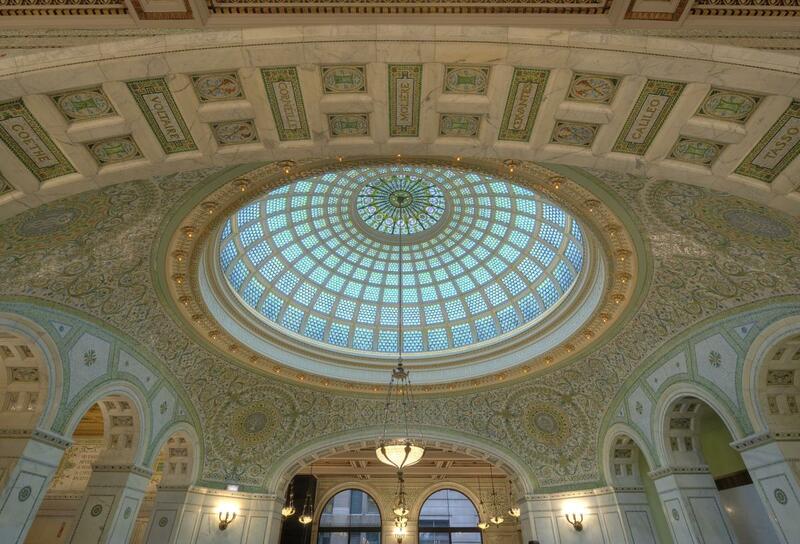 Experience the magnificent architecture of this historic building during a private Chicago Cultural Center tour. The guided tour will take your group beneath the world’s largest Tiffany stained-glass dome, past colorful mosaics and through rooms featuring intricate detailing such as marble arches. Private tours for groups of 10 or more are available by appointment, and should be booked two weeks in advance. See the ever-changing Chicago Cultural Center events calendar to find what will be going on during your next visit. 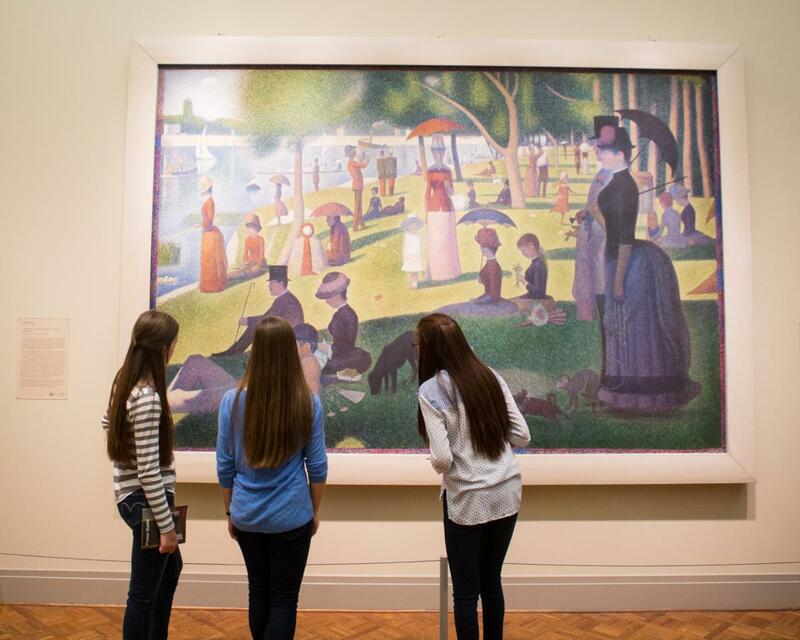 The Art Institute is known around the globe for its amazing collection of artworks, ranging from Old Masters like Monet to contemporary pieces by Andy Warhol. But did you know it’s also a great place for an elegant lunch? Terzo Piano, located on the third level of the stunning Modern Wing, is headed by award-winning Chef Tony Mantuano. Enjoy upscale Italian dishes in the chic dining room or on the terrace overlooking Millennium Park. Afterwards, arrange for a private group tour of the impressive art museum that features one of the largest collections of French Impressionist works in the world, with outstanding pieces by Renoir (including the monumental A Sunday on La Grande Jatte), Degas, Van Gogh, Gauguin and more. The Modern Wing is home to the Art Institute’s collection of 20th- and 21st-century art, with contemporary artworks by artists that include Picasso, Magritte and Kandinsky. If you’ve got a student or youth group, then a visit to Maggie Daley Park is a must. Named for Chicago’s beloved former First Lady, this spectacular 20-acre oasis of green space in the city is an outdoor fantasyland. The fun Play Garden features suspension bridges, tube slides and a big ship to explore. Older kids will want to tackle the 40-foot-tall climbing wall or putt along the 18-hole mini golf course through Chicago-themed obstacles like a six-foot-tall Willis Tower. In the winter, glide along the curvy Skating Ribbon (skate rentals are available). Walk across the spectacular stainless steel BP Bridge to reach neighboring Millennium Park. Millennium Park is Chicago’s downtown playground for the arts. Intriguing larger-than-life public art includes the multimedia Crown Fountain featuring projected faces of everyday Chicagoans and Anish Kapoor’s huge reflective Cloud Gate sculpture, which is affectionately known as The Bean and is a favorite backdrop for the ultimate Chicago selfie. The Boeing Galleries on the north and south ends of Millennium Park feature rotating outdoor exhibits of contemporary art. Spend some time in the beautiful Lurie Garden and arrange for a private group tour of the grounds. Or make reservations to take a Chicago Greeter tour of Millennium Park with a local who will customize a free tour for groups of up to six guests (in more than a dozen different languages). Have dinner at Park Grill, located at the gateway to Millennium Park, serving sophisticated American cuisine. The restaurant overlooks the McCormick Tribune Ice Rink, open from mid-November through early March (weather permitting). In the evening, catch a free concert through fall at the outdoor Jay Pritzker Pavilion, an architectural marvel notable for its crown of billowing stainless steel ribbons. Or see a music or dance performance at the Harris Theater (through mid-May).